I added this recipe to our menu for the week the instant I saw it on Fabulously Delicious! 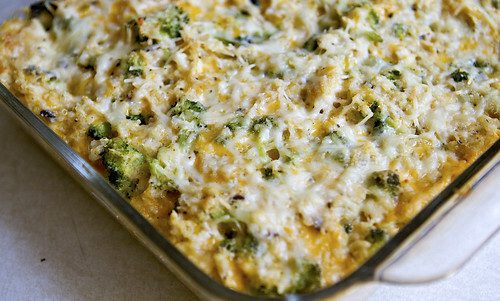 I LOVE cheesy, broccoli dishes and we haven't had anything like that in awhile since we have been trying to eat healthier. But guess what?! 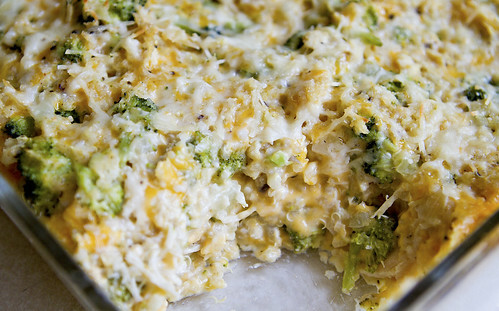 This one isn't bad for you and it is still cheesy and delicious!!! So definitely try it, you will be glad you did! In a small saucepan combine the quinoa, water, and salt. Bring to a boil over high heat. Reduce heat to low and cover. Cook for 18-20 minutes, or until fluffy and the white ring/tail is visible. Fluff with a fork. Preheat oven to 350 degrees and coat a shallow (8×8 in or 5-6 cups) casserole dish – or individual ramekins – with vegetable cooking spray. In a large bowl combine the soup, mayonnaise, milk, shredded cheese, Splenda, pepper, and nutmeg until well mixed. Stir in the quinoa and broccoli. Spoon mixture into prepared casserole and bake for 35-40 minutes (20-25 minutes for ramekins) or until bubbly on the edges and golden. Makes 8 generous 1/2-cup servings. *NOTE FOR GLUTEN FREE…Progresso makes a Creamy Mushroom Soup that is gluten free…or here is a recipe for a Cream of Anything Soup. In a small saucepan, whisk milk and cornstarch till well blended. Stir in butter, bouillon, salt, and pepper. Heat to a boil, stirring frequently. Simmer on low for one minute more to thicken. Use in recipes to replace one can of cream of anything soup. Stir in a drained 4 ounce can of mushroom pieces to the recipe above. Use in recipes in place of one can of Cream of Mushroom Soup. Stir in 1/2 cup cooked chicken pieces to the recipe above. Use in recipes in place of one can of Cream of Chicken Soup. Stir in 1/2 cup sautéed chopped celery to the recipe above. Looks delicious! I love the idea of using quinoa to make it healthy. Thanks for sharing! looks so yummy and there's not a lot of things that look that good to me lately! Thanks for sharing !